For over 50 years we have provided the motor industry with ways to supply number plates. Use the boxes below and take a look between printing them yourself or getting them made up on demand. Designed to deliver every time. We’ve used all our experience to deliver solutions and services that are perfect for producing number plates. Tried and tested, they offer a simple choice between printing them yourself or having them made up for you on demand. The printing solutions offer an easy answer to self production, because their specialist equipment comes with online ordering and technical assistance. Want an easy way to provide number plates of any size, style or specification? Then, take a look at our made up plates service. 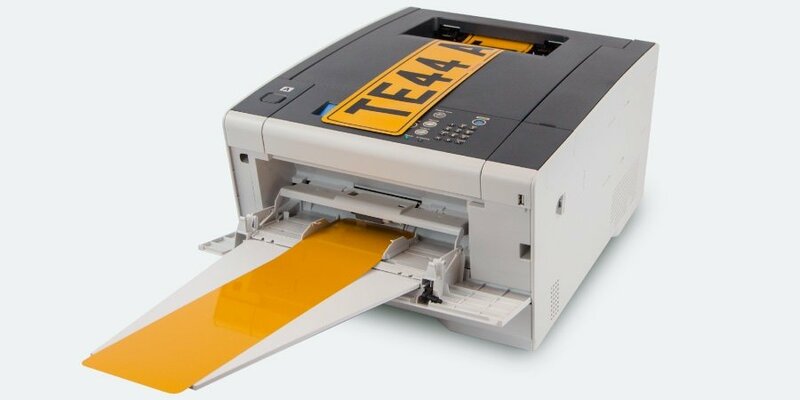 Our range of number plate printers are packaged as full business solutions. They cover simple POS production, all the way up to centrally controlled hubs serving multiple branches. Their modern equipment and our plate components provide everything needed to deliver production with increased capability, lower costs and greater profits. Made up plates provides finished number plates to clients without them having to print and assemble them or to purchase costly equipment. Subscribers can select from every size or shape and assign company branding to be used on the bottom of each and every one. Designed for use by our printing systems, our Plate Components come in every size and shape needed. Produced In-House and guaranteed to conform to British Standards, they are matched components that simply need combining together. Showcase your brand and maximise your exposure by making the most of the bottom lines on your plates. Our designers can work with you to create suitable artwork that reflects your company. You can even order plate components pre-printed with your chosen branding. We follow best practices and industry standards to deliver top quality number plate services and products. In fact we operate with one single aim in mind, the production of Road Legal Number Plates compliant with British Standards. This includes in-house testing for self-certification and submitting samples for third party certification. All our goods and services comply with industry standards and regulations. To achieve this, we pursue and hold certification from all relevant schemes and organisations. Read more on our Standards & Accreditations. I have been a customer of Tennants UK for many years and always found the staff and service to be of a very high standard and the products to be competitively priced and of a high quality. The quality of the print is excellent with the OKI printers, and the software is very easy to use. We get regular updates on our software and the backup is amazing. We have worked with Tennants for some time now and we have never felt there is any need to look elsewhere, they always have the stock, their prices are great, delivery is next day and the service and care is faultless. We always receive fantastic service from Tennants UK. Our orders are despatched same day and we receive the order next day. Any queries are dealt with promptly and efficiently. One of the first things that we noticed since moving across to the Tennants UK number plate system was the quality of the finished product. We have used Tennants as our plates supplier for over 10 years and love the flexibility of the LG System, which reduces our stock holding as we only need to carry blank film media and print to order. For more information call number plates on 0115 9738084, email sales@tennantsuk.com or fill in the quick form link above with your contact and inquiry details.